Getting along with others is foundational to success in personal and professional life. In an increasingly diverse and complex world, we need to overcome distance and tight schedules to achieve shared goals. But how do we learn to work together if our learning experiences focus on individual performance? 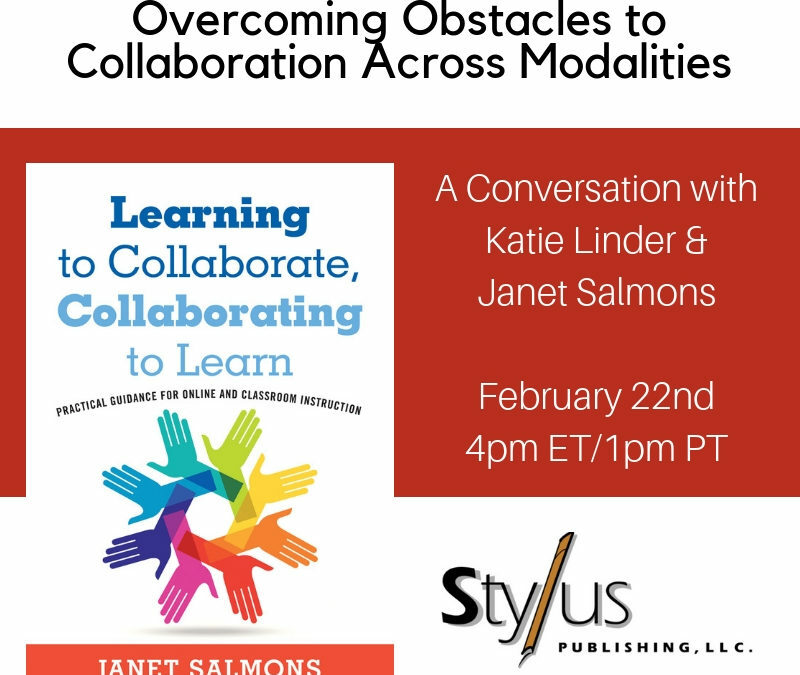 In this webinar we’ll use Janet Salmons‘ Taxonomy of Collaboration as a framework for understanding dynamics of the collaborative process. We’ll discuss ways to embed collaborative skills-building into assignments, courses, and/or curricula that engage students of all ages. View recording now if you missed this Stylus webinar! Want to offer a webinar about collaboration & learning for your colleagues, department, or teaching and learning center? Join the virtual book tour! Details here. Click for your time zone.